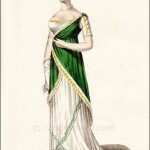 Fashions of London and Paris, March 1807. 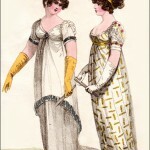 Though the description does not say so, it appears that these two figures show variations of the same basic dress. 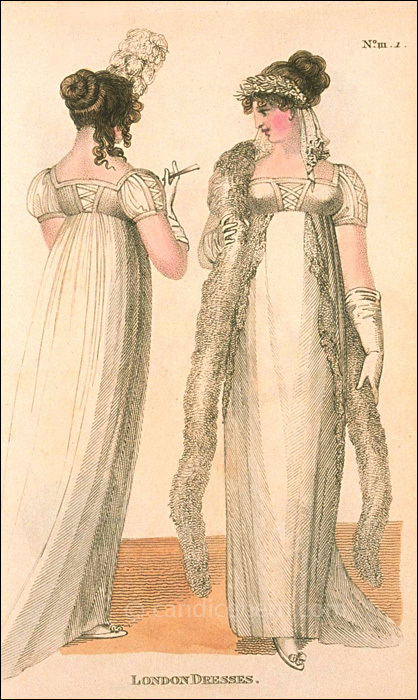 The bodice and sleeves are the same, but the figure on the right shows the addition of a crepe robe trimmed with lace, plus the fabulous tippet (what we would call a boa). “Fig. 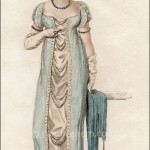 1.–A dress of white crape over a white satin slip; the dress made very low in the back, and laced with white satin ribband; the sleeves full and laced to correspond with the back; the bosom and the bottom of the sleeves trimmed with white satin ribband. The hair dressed in the most fashionable manner, with a white military feather.